Does your thirst feel never-ending? Do you feel unsatisfied even after having multiple glasses of water? If you answered yes to these questions, there is a high chance that you are dehydrated. When your body loses more water than it takes in, it may lead to dehydration (1). ). Although dehydration is quite common among all age groups, it may have more hazardous consequences for children and older adults. 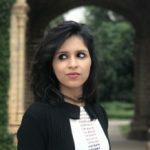 However, your worries can take a back seat because some of the best home remedies to combat dehydration are listed here. Read on to find more about the causes of dehydration, its symptoms, side effects, and remedies to treat it. Dehydration occurs when your body is unable to retain fluids and electrolytes. When there is a reduction in the water content of the body, the salt-sugar balance goes haywire, which affects the functioning of the body. There are many factors that cause dehydration. Let’s take a look at them below. Diarrhea Or Vomiting: Both diarrhea and vomiting lead to excessive loss of water from your body, and this can cause dehydration. Fever: Running a high fever increases your chance of becoming dehydrated. Frequent Urination: Frequent urination following a disease like diabetes or intake of certain diuretic medications also has the potential to result in dehydration. 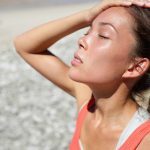 Sweating In Excess: If your body loses a lot of fluids after an intense workout, you are at a higher risk of becoming dehydrated. Age: Older people and infants are at higher risk of becoming dehydrated. Chronic Illnesses: Individuals suffering from chronic diseases, such as diabetes and kidney diseases, are also at higher risk of becoming dehydrated. Weather: Extremely hot or cold weather has the potential to cause excessive water loss in your body, leading to dehydration. Let us now look at the common signs and symptoms of dehydration in adults and infants. Dehydration could be a major concern when it affects children and must be attended to immediately. Let’s now look at some side effects that are often associated with dehydration. Dehydration can turn serious when left untreated and may also lead to a medical emergency. It is, hence, of utmost importance to treat the condition as soon as you observe its onset. You can do so by following the simple and natural remedies mentioned below. Have a banana before indulging in any intensive physical activity. Dehydration causes a deficiency of potassium in your body. 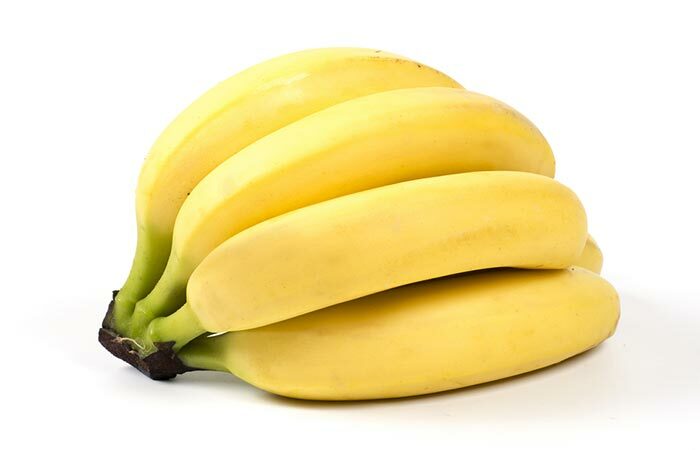 Bananas have high potassium content and can help replenish its levels and combat dehydration (3). Bananas can be included in your infant’s diet only if he/she is more than 6 months old. Mix dry ginger in a cup of buttermilk. 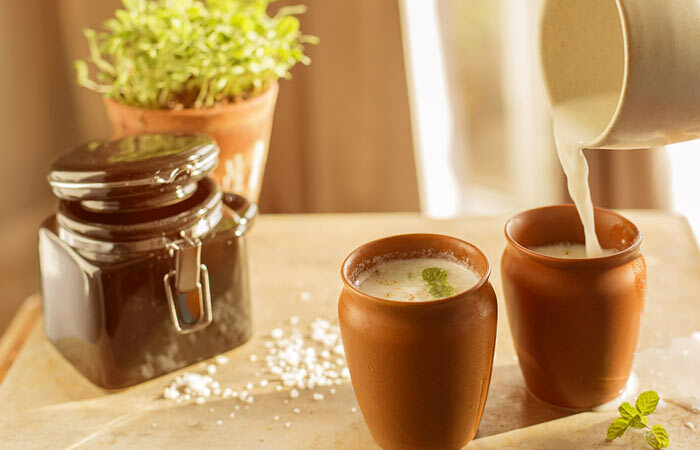 You must drink buttermilk at least 3 to 4 times a day to combat dehydration. Buttermilk is a natural probiotic. It is rich in minerals such as potassium and magnesium that are often depleted when you sweat excessively and become dehydrated (4). Note: Buttermilk is not only safe but also beneficial for your infant’s overall health. Add a cup of barley to water and bring to a boil in a saucepan. Simmer for 40 to 50 minutes. Let the barley infusion cool. Strain the barley water and add lemon and honey for flavor. Drink this infusion at regular intervals throughout the day. Do this 3 to 4 times a day. 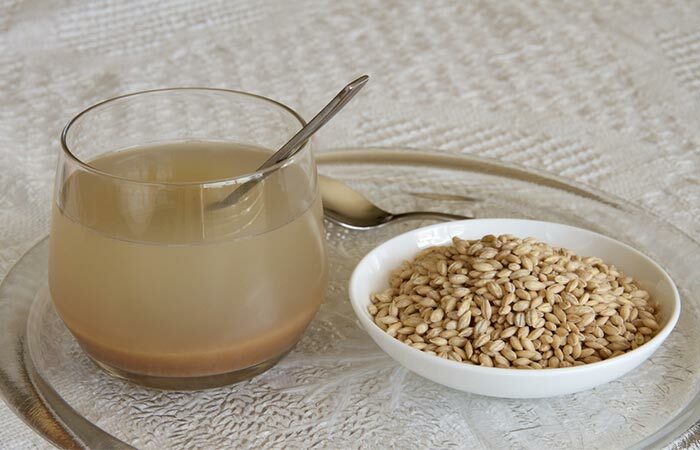 Barley water is an extremely healthy drink. It is loaded with many antioxidants, vitamins, and minerals that can help to restore the fluids lost by dehydration and keep you hydrated (5), (6). Wait for your little one to turn at least 6 months before introducing barley to his/her diet. Soups are good sources of nutrients that can help in dealing with dehydration and its symptoms. The high content of minerals like potassium in soups makes them an ideal option to restore the lost nutrients in your body. 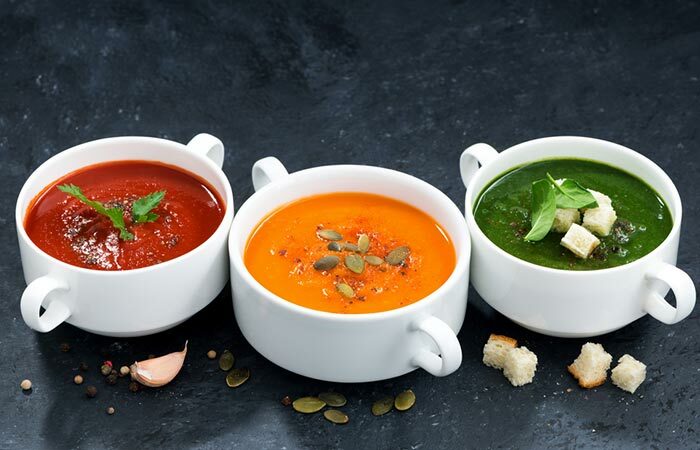 For best results, consume soups before a rigorous workout session to help you stay hydrated. They can be used to treat dehydration in babies once they turn 6 months old. Drink young coconut water throughout the day. You must drink coconut water 4 to 5 times daily for best results. 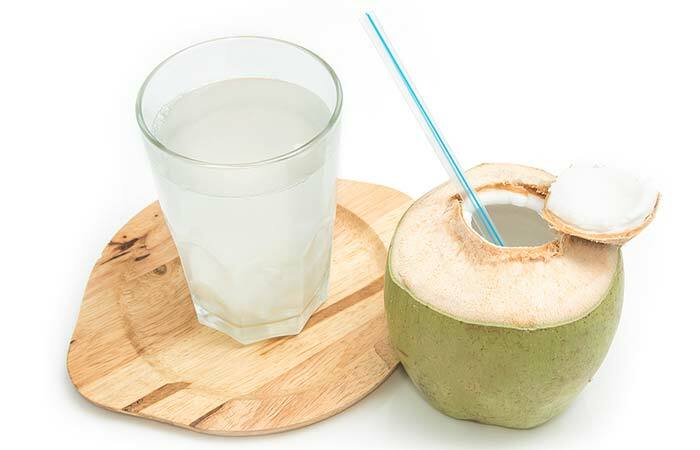 Coconut water is high in sodium and potassium, the levels of which are often depleted when you are dehydrated. This makes it one of the best options to treat dehydration naturally (7), (8). Give coconut water to your baby only once he/she completes 6 months. Add a few drops of lemon essential oil to a glass of water. Drink the lemon-flavored drink once daily. Lemon essential oil has antioxidant and cleansing properties and is great to keep you hydrated and healthy (9). Add a couple of drops of wild orange essential oil to a glass of water and mix well. Consume this flavored water throughout the day. Drink this water at least once daily. Wild orange flavored water is a refreshing antioxidant drink that promotes overall health and enhances the functioning of your immune system. It is a flavorful and healthy way to treat dehydration as compared to unhealthy drinks with high sugar content (10). Add a few drops of peppermint essential oil to a glass of water and consume daily. Peppermint oil contains potassium and magnesium – the reserves of which are low in dehydrated individuals. This peppermint oil infused water can help replenish the potassium and magnesium levels in your body and treat dehydration (11). 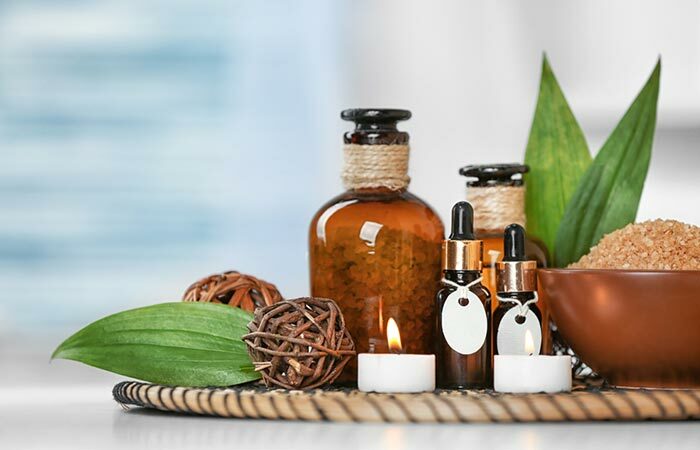 Infants and children should not be given essential oils internally until they are at least 6-10 years old. Add the salt and sugar to water and mix well until they are completely dissolved. Drink this solution until the symptoms abate. Do this multiple times until you have consumed at least 3 liters of this solution in a day. ORS stands for Oral Rehydration Solution. The name itself gives away the use of this remedy, i.e., to treat dehydration. Consuming ORS is one of the best ways to replace the lost fluids in your body. 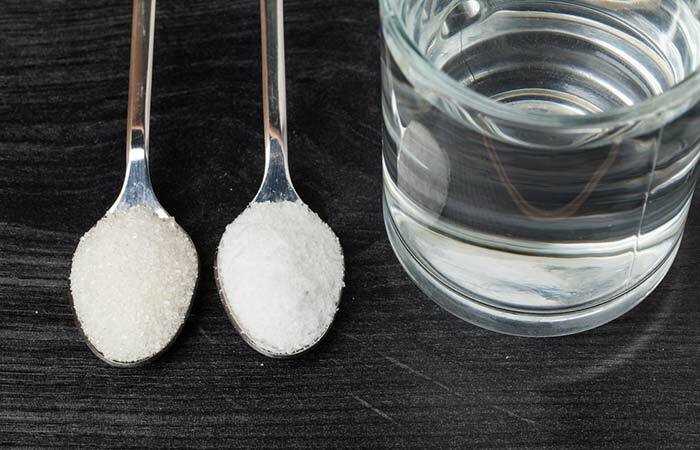 This is because the glucose content of sugar used in ORS helps in increased uptake of sodium and water that are lost due to dehydration (12), (13). Note: ORS is one of the safest options to treat dehydration in infants. However, it is best to consult a doctor before doing so, especially if your infant is less than 6 months old. Drink pickle juice before or after an intense workout. 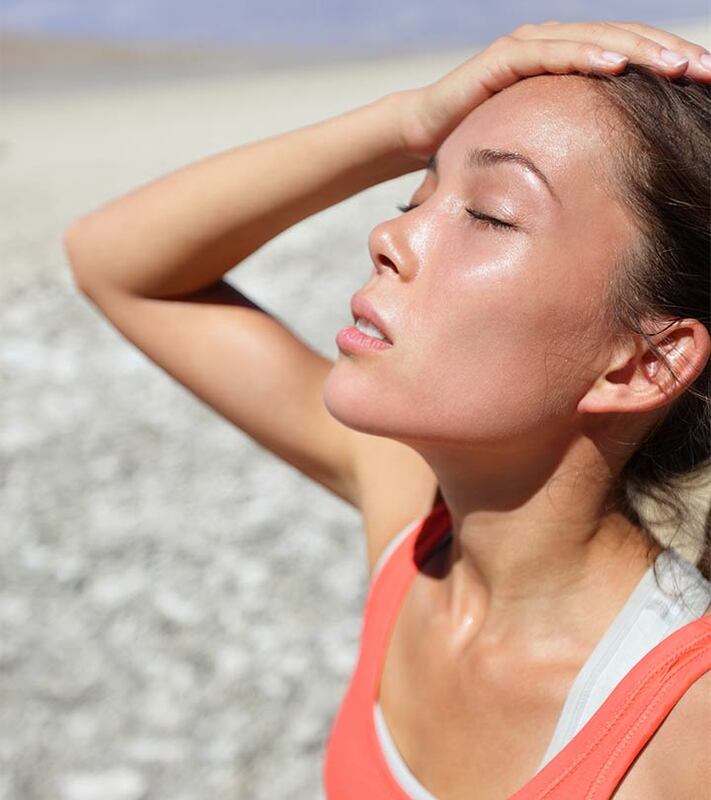 Your body tends to lose a lot of potassium and sodium when you sweat excessively, and this leads to dehydration. 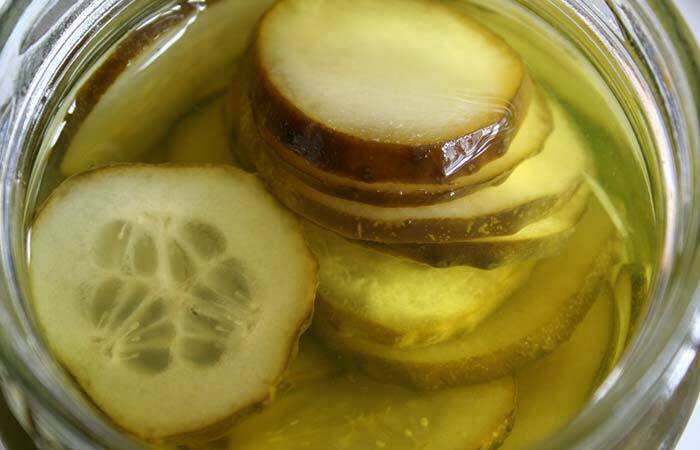 A study revealed that men who were dehydrated found immediate relief from muscle cramps after consuming pickle juice. Pickle juice is high in sodium and is also known to have some amount of potassium in it. Thus, it is one of the best remedies to treat dehydration as it restores the electrolyte balance in your body (14). Do not give pickle juice to your little one. Drink at least 2 glasses of unsweetened cranberry juice daily. Drink this juice twice daily. 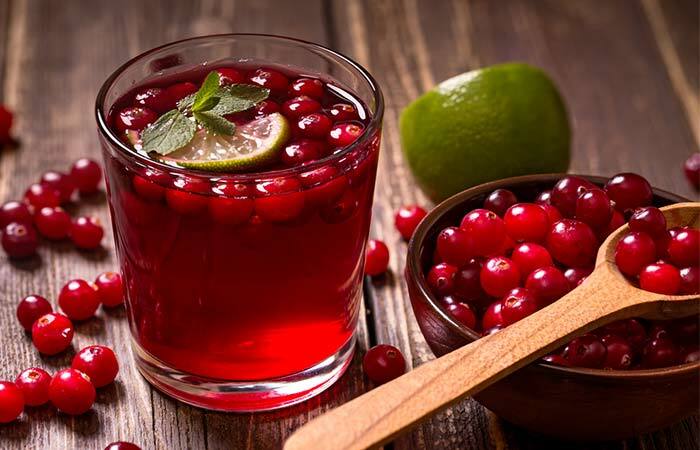 Cranberry juice has high water content and is one of the best ways to treat dehydration naturally. It also contains essential sugars and salts that are often lost when you are dehydrated (15). Blend an apple with half a glass of water. You can drink this juice twice daily. Apples are a rich source of magnesium. They also contain trace amounts of potassium and can, therefore, help in treating dehydration by restoring the lost minerals and electrolytes in your body. 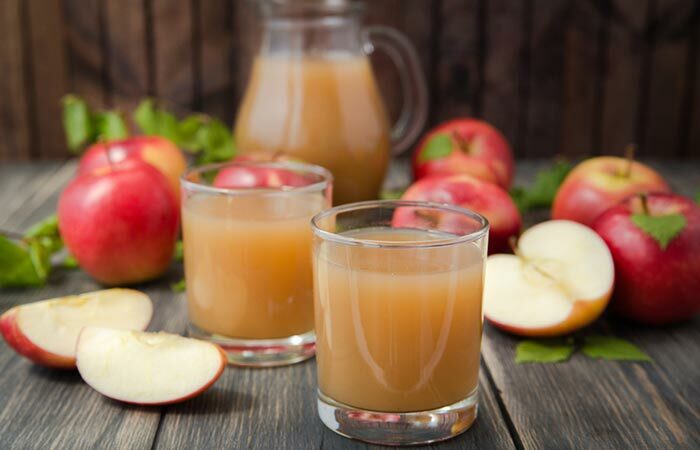 According to a study conducted in 2016, diluted apple juice is a more effective option as compared to electrolyte drinks to treat dehydration in children (16), (17). You need to wait for your babies to complete at least 6 months before introducing fruit juices and solid foods in their diet. 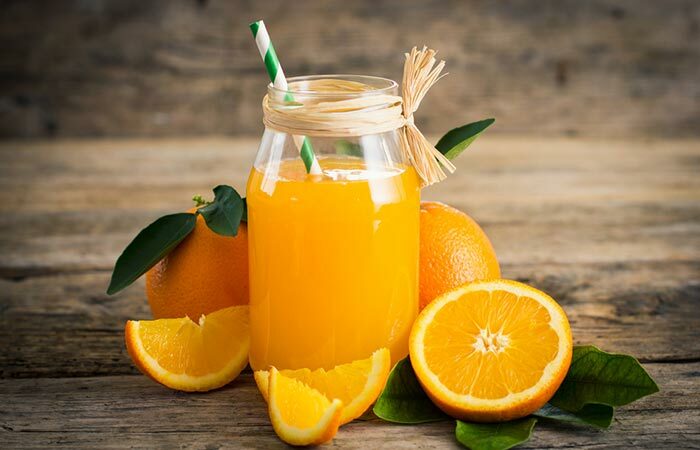 Drink a glass of unsweetened orange juice before or after a strenuous workout. You must drink this juice once or twice a day. Oranges are rich in a lot of vitamins and minerals. They also have electrolytes such as potassium and little amounts of magnesium present in them. Oranges, therefore, have the potential to keep dehydration at bay by maintaining the electrolyte balance in your body (18). Children below 6 years of age should consume just half a cup of orange juice in a day. Drink lemon water two to three times a day. 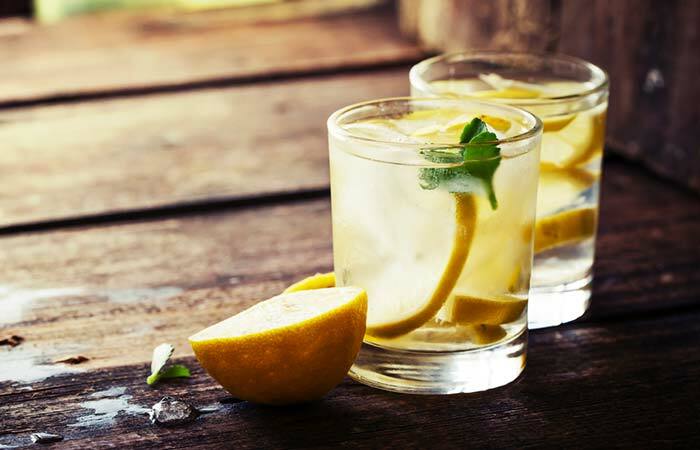 Lemon water not only refreshes you but also helps you overcome dehydration by restoring the levels of potassium, sodium, and magnesium in your body (19). Wait till your baby is 6 months old before introducing lemon to his/her diet. When you are dehydrated, your body ends up losing many significant minerals and electrolytes such as magnesium, potassium, and sodium. In such a situation, it is recommended to increase the intake of these to balance their amount in your body. Your body has the natural ability to maintain the balance of sodium and water. When you are dehydrated, this balance is disturbed. Thus, increasing the amount of salt in your diet via sports drinks and foods rich in sodium can help your body regain the sodium-water balance. This, in turn, can help combat dehydration (20), (21). Add a pinch of salt to a cup of yogurt and mix well. Yogurt is a rich source of electrolytes and can hence combat dehydration by restoring the lost electrolytes in your body (22). 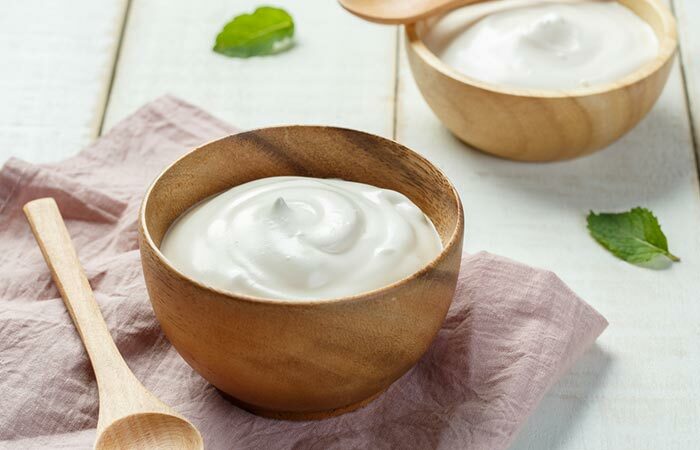 You can include yogurt in your infant’s diet if he/she is older than 6 months. 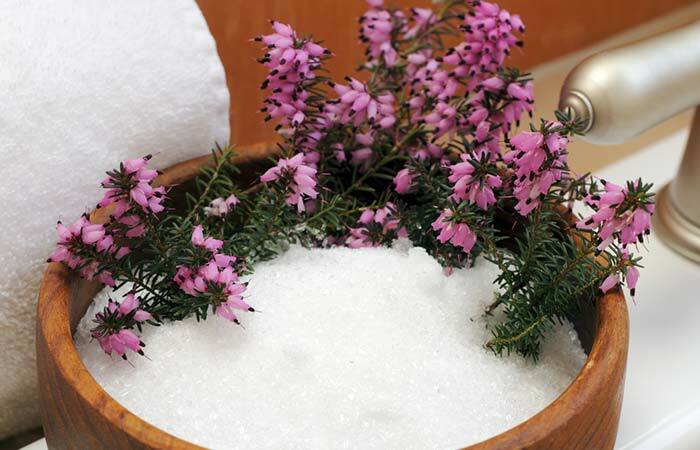 Add a cup of Epsom salt to your bath water. Soak and relax in the bath for 15 to 20 minutes. 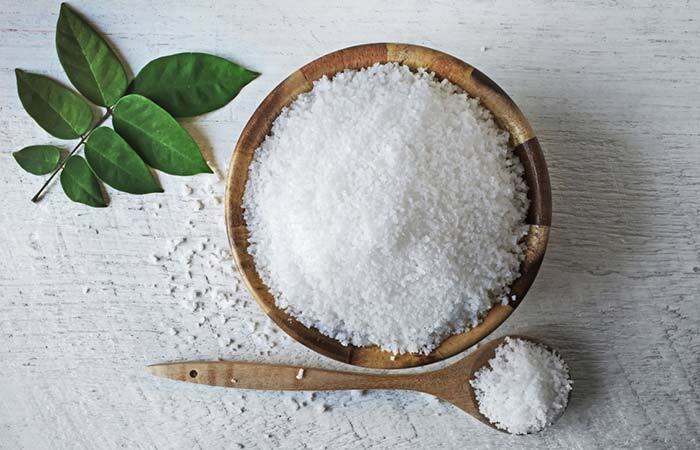 The magnesium in Epsom salt can help to combat dehydration and its symptoms when absorbed by your body (23). Although an Epsom salt bath is relatively safe for children, it may cause issues if the bath water is swallowed. Infants below the age of 1 should be kept away from this treatment. Although these remedies can help you in your fight against dehydration, following a few preventive tips and making a couple of lifestyle changes will prove beneficial in treating this condition. Include plenty of water and hydrating juices like watermelon and strawberry in your diet, especially before and after a rigorous activity. Use an electrolyte sports drink if you are planning to workout or exercise for more than an hour. Avoid alcohol consumption as it increases dehydration. Quit smoking as it can cause dehydration in the long run. Wear lightweight and light-colored clothes if you are working out or exercising outdoors. Follow a healthy diet with high water content foods such as cucumbers, yogurt, papaya, and green salads. Now that you know how to treat dehydration naturally, what are you waiting for? All the remedies mentioned above will help you combat dehydration. However, in serious cases, it is best to consult your doctor immediately. You can go ahead and use these remedies for mild to moderate cases of dehydration and let us know if they worked for you in the comments section below. Is milk good for dehydration? Yes, milk is a very good option to rehydrate you. In fact, a study concluded that milk is better than water and electrolyte drinks to combat dehydration due to its high content of nutrients and electrolytes. But if you are worried about those extra calories, better stick to water. What are the best drinks to treat dehydration besides water? Besides water, fruit juices such as watermelon, strawberry, and orange, whole and skimmed milk, sports drinks, as well as coconut water can help in keeping you hydrated. Which is the best electrolyte drink that can prevent dehydration? Oral rehydration solution (ORS) is one of the best electrolyte drinks to prevent dehydration in adults and infants alike.